As my baby becomes a full blown toddler I have taken on a new job and that is teacher! Each day I get with my toddler is a new adventure full of discovery and amazingness. What I’ve come to realize is that this new job is one that every parent must take on. Not every one is cut out for teaching, so I’ll tell you what I’ve learned in hopes that it makes the transition easier for you. While working on my Masters of Education I had a wonderful professor who taught me about patience. Each class period we would have to present the beginning of a lesson and all our classmates were told to act like students and ask questions and be honest about whether the lesson interested them or not. It was so much fun and so eye opening. What I learned from this exercise is patience is key. Many of you might be familiar with the frustration that goes along with teaching something. I think that frustration comes from an imbalance of understanding. What I mean is that one person has a greater understanding and one person does not and that imbalance creates frustration for both. I believe it is the teacher’s responsibility to strike the balance and remove the frustration. Teaching in a classroom and teaching your child are very different in that one offers more control. In a classroom there is a specific unit and lesson and so everyone in on the same page about what is being taught. With a child, it’s random and all over the place. You have to search for learning moments and think on your feet and FAST! When ever we go shopping for groceries I will see other kids and parents at the store and of course I notice other parenting methods. 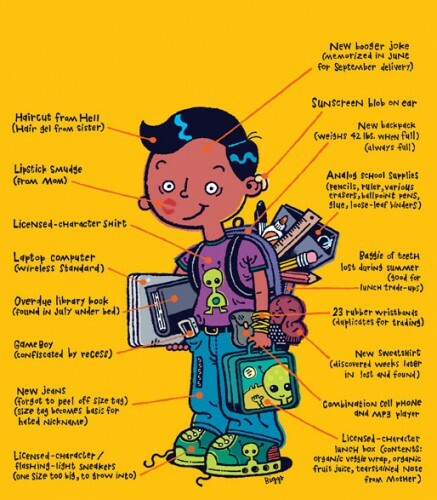 I want to emphasize right now that there are many different ways to parent a child and none of them are “wrong”. It all depends on your desired outcome, your goals, your child. I’m only referencing these other parents because their style is different from mine and a pretty good comparison. It might be working for them, but I know it wouldn’t work for us. So anyway, at the grocery store I will see kids touching the vegetables or different items and the parents yell and tell them to stop. My son almost ALWAYS reaches for a fruit or vegetable so I take that moment to teach. I grab his hand and squeeze and bring it to our noses and smell and describe to him how to pick the right one. He probably half understands what we’re doing, but he sees the action and so he repeats it and one day soon he will understand the concept and then he will know how to pick fruits and vegetables. Some day I imagine his spouse will thank me for this wonderful lesson. Other times he asks me for a cup and so I give it to him. He promptly takes it over to the fridge and reaches up to fill it from the water dispenser. He’s not quite tall enough to hold it properly so the water will come spraying down onto his tiny face and he squeals with laughter and looks at me with a huge smile on his face. At this moment I’m not so concerned with the water all over the kitchen tiles that I now have to clean up. What I see is that he understands that the fridge is where drinking water comes from and the cup is what you put it in. He already has the basic building blocks there and now I need to help him fine tune his motor skills. He’s a child, I certainly can’t expect him to do this perfectly. So I grab his hands and help him with the motion so that he is able to do it on his own somewhat. What’s most important here is that you bring yourself to the child’s level of understanding. If my son takes his bowl of grapes and turns it upside down sending grapes rolling in every direction. I can’t get mad at him for it. He has just learned about gravity! How can I be upset at him for something that scientists do for a living? It is an experiment. Life is an experiment. It’s all trial and error and that’s how we learn. I’m not perfect, I used to get frustrated until I realized the value of these moments. What I’m trying to say is, sometimes it creates more work for you, but the lesson that your child is learning is worth that extra bit of work. Children learn through discovery. If I was to grab the glass out of his hand or take the bowl of grapes out of his hand before he tips it all the way, what will he learn? He may even feel like he did something wrong. But did he? No, of course not. So be patient and find the learning moment. You really have to think fast because these moments go by so fast and sometimes our natural instinct takes over and we miss the moment entirely because we were too caught up on trying to avoid extra work. I let my son make the mess and then I show him the way it should be done and then he copies. He sees the consequence and then he learns. He also sees me cleaning up and learns to do that as well. He actually cleans up on his own now. He seems to have realized that things have their place and trash belongs in the garbage. Another moment we had was with a pot on the stove. We were cooking dinner and he insisted I hold him so he could watch. He likes to stir the food and “help” make the food. Sometimes he puts ingredients in the pot for me. He’s a wonderful helper. Now the biggest danger here is the heat. I don’t want him to burn himself and perhaps the natural instinct here is to aggressively pull his hand away when he tries to touch the hot part of the pot. I didn’t do this though. He was ever so slowly trying to touch the side of the pot. (We’ve held his hand near heat before to show him that something is hot and not to touch). His curiosity ALWAYS gets the better of him so I thought ok let’s see what happens if I just let him. He very gently touches the side with his finger and then immediately pulls away and looks at me with a surprised face and says the Gujrati word for hot. YES! He understands this is hot. He doesn’t touch and reach for it anymore. He points instead and says ‘hot’ in our language. To which I reply, ‘yes, that’s right, it’s hot’. Lesson learned. I’m not saying put your child in harms way. By no means let him run in front of a bus so that he knows to look both ways. But sometimes just letting them make the mess, or get a little close to danger teaches them first hand. This doesn’t work for every child, and it takes A LOT of supervision. I am always focused on what my son is doing and it’s all about him. If he is in real danger I don’t allow it, it’s the little dangers that won’t really harm him that I allow with EXTREME supervision. If I have to do something while I’m with him like laundry or dishes then I involve him. I never take myself away from him to do something. Unless of course he’s watching Bubble Guppies and learning from Mr. Grouper. Having kids is work, no doubt. That is to be expected. The challenge lies in meshing that work with our busy schedules. I know sometimes you just need to get things done or get out the door, but it only takes a minute or two to set the example. Don’t under estimate the effect of brushing off these learning moments because you’re busy. Put it in perspective. Obviously when you’re leaving for work in the morning is not the time to hand your child a bowl of grapes to experiment with. You do have some control. But do take the time to teach. Having kids is a learning process. For both child and parent. No one is perfect at it and there is no right or wrong way. Don’t let anyone ever make you feel like you’re doing things wrong. People always have a bag full of unsolicited advice. Listen patiently and nod and smile. Sometimes there’s pearls of wisdom and sometimes it’s just irritating because they don’t know you or your child. There’s nothing like the feeling of your child acquiring a new skill. And it’s even better when you had something to do with it. My little angel is rapidly growing independent and it’s scary and exciting at the same time. We want to make sure he’s a good man to his friends and family, a wonderful husband, and a loving father. He’s got the perfect example in his daddy. 🙂 Yea, yea I know, my perfect husband 🙂 But HE IS! I hope this helped or at least gave you a different perspective. A little patience goes a long way. Good luck! Not really sure why this post took me a million years to post. Perhaps my time management skills have taken a vacation as of late. This is the easiest recipe in my book. Seriously, you could pay your kid to make it. So easy. 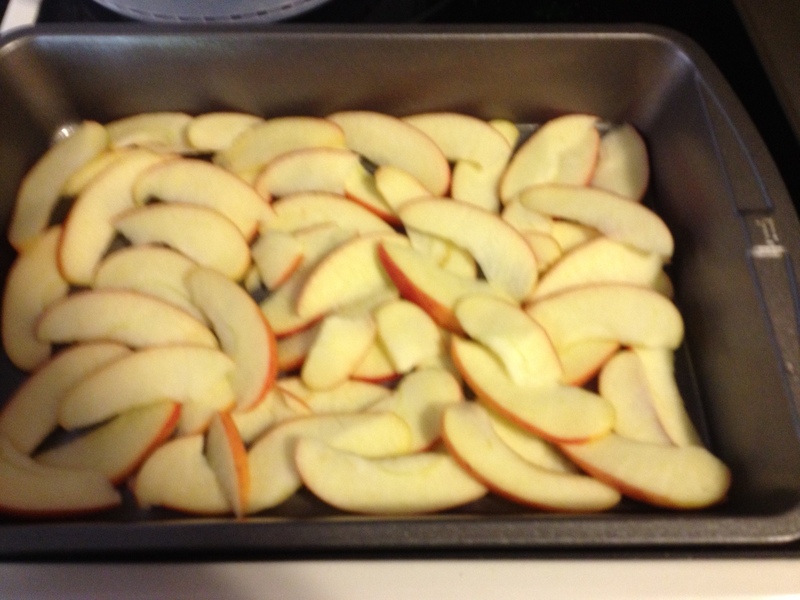 A couple of apples sliced into thinnish slices. Enough to cover the bottom of a 9×13 pan. box of ready made cake mix like Pilsbury, Duncan Hines, or Betty Crocker – vanilla type flavors work best or anything that goes well with apples. You won’t believe how incredible this tastes! It’s great with a scoop of ice cream! A little tip, check on it while it’s baking, if you see any dry spots just add a little water to that spot. The moisture from the apples should come through most of it, but sometimes you get a few dry spots. Come holiday time you can mix together angel food cake mix and apple pie filling from the can, bake for 30 minutes or so at 350 degrees or until the top is brown. I just went on a wonderful gastronomic adventure! I will post about it, I took pictures of most everything I ate! But while I’m trying to catch up after having a week off, please give me a few days to get pictures uploaded and write you a wonderful story about what I experienced. Vacations, I love, it’s the aftermath that makes it crazy. I had no worries all week long and then I come back and realize I have so much to do to catch back up. I have to make up hours, catch up on work things, and get things together for school. Not my school, but my SON! AHH! He’s starting school next week! I have mixed feelings. I’m really happy about it because I know he will learn and grow and really benefit from the environment change. I feel a bit sad because my baby is rapidly becoming a little boy and soon he will be graduating and we’ll be dancing at his wedding. Time goes so much faster with a child. Those of you parents out there that just experienced the first day of school…I am on your boat. This year I wish my angel valuable learning moments, wonderful friends, and fun times! 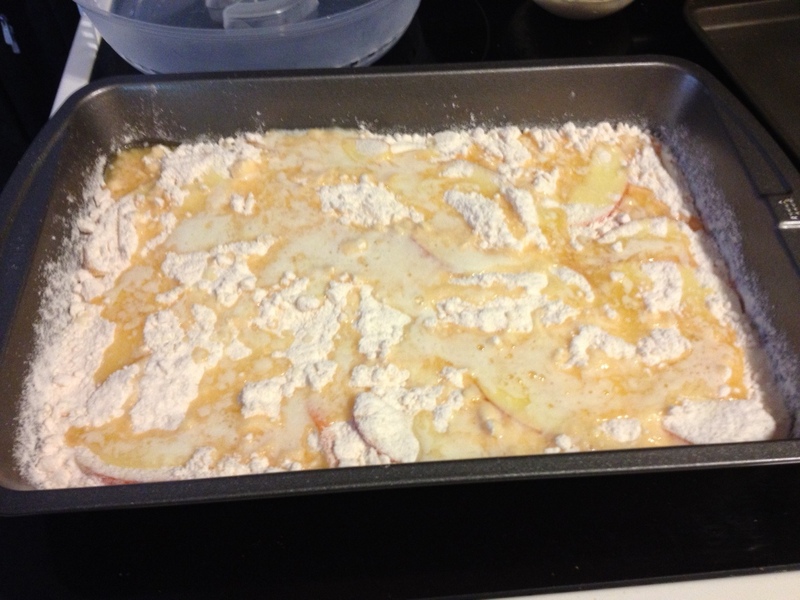 Stay tuned I’m working on my post for the easy peasy apple cake…YUM! 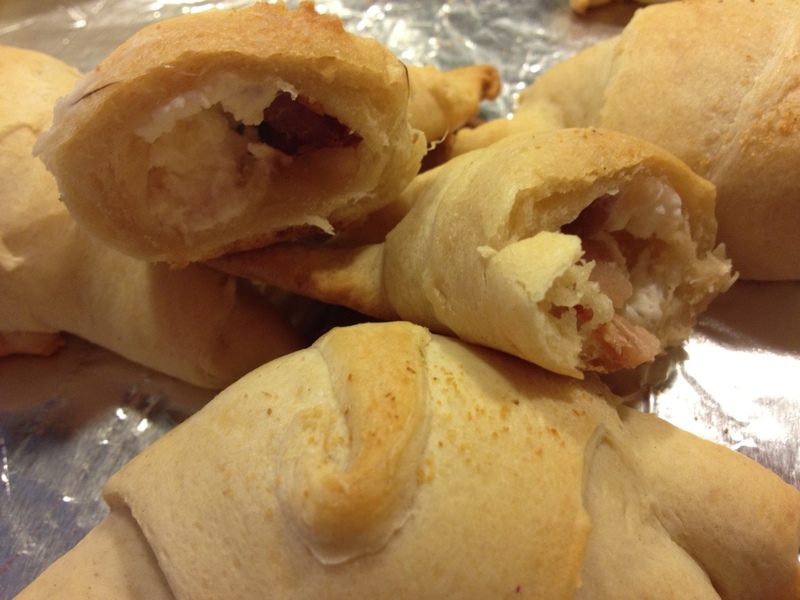 It is football season here in the US and that means appetizers and game food galore! We don’t really keep up with sports in our home, but we still enjoy game food every now and then. I remember once upon a time I used to sit and watch the game, but these days family time is just too precious. Reason # 293847923847384 that I love my husband – he agrees! I know this is a rare quality! He puts me and our son first and any free moment he gets, he’s with us. So football obsession doesn’t exist in our home, thank God. This is a twist on jalepeno poppers. 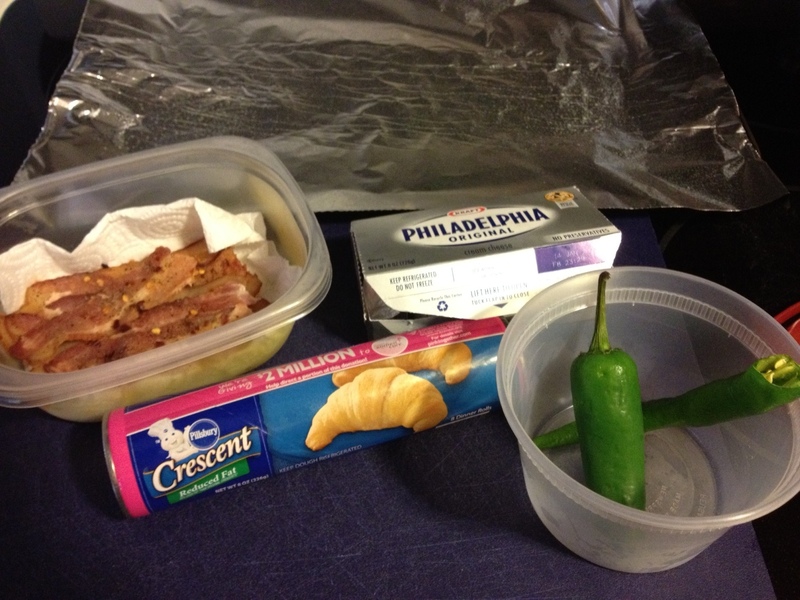 Although I LOVE a good jalepeno poppers and I’m pretty sure I make the best ones, sometimes its tedious. Cleaning out the peppers, mixing the cream cheese, stuffing them, breading them, etc. I thought..hmm..why not stuff them in bread?! This is like a jalepeno pepper and a kolache had a baby. DELICIOUS! 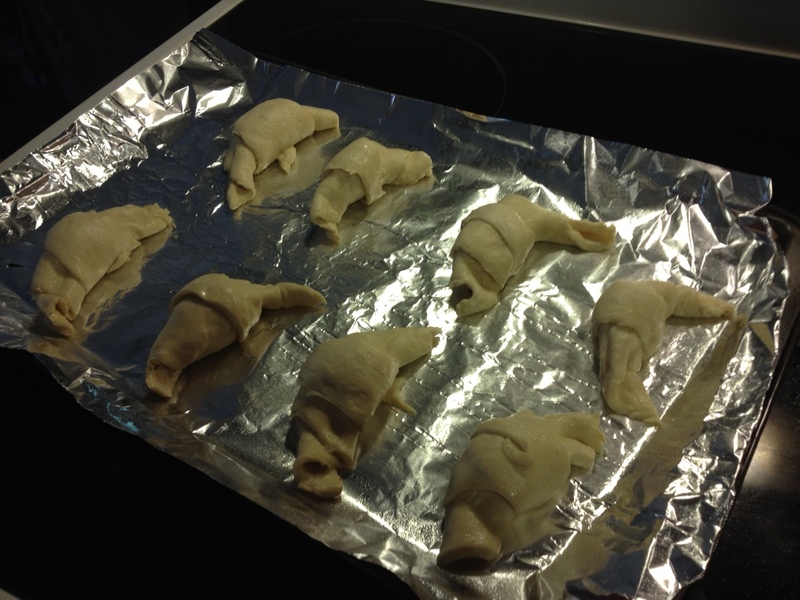 First things first you have to POP open that can of rolls and unroll the dough. Place it on a greased cookie sheet. 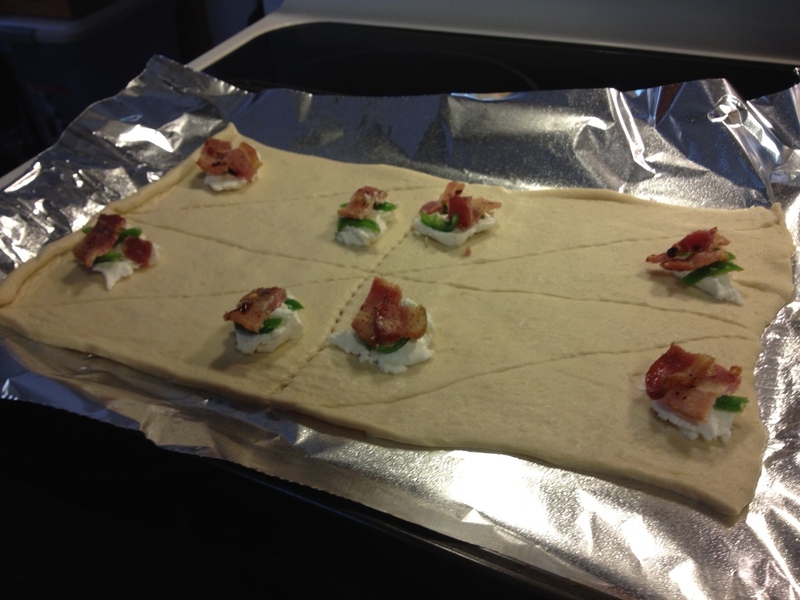 Put a little bit of cream cheese in the center of each triangle and then top with bacon and jalapeno. We got a really strong batch from the farmer’s market so I only put two slivers in. Next roll up the rolls and make sure to seal around the cheese so it doesn’t ooze out. You could add in some mozzarella if you want it more cheesy. See how innocent they look? Cook it like normal, until it’s golden brown. I think it’s at 350 degrees. 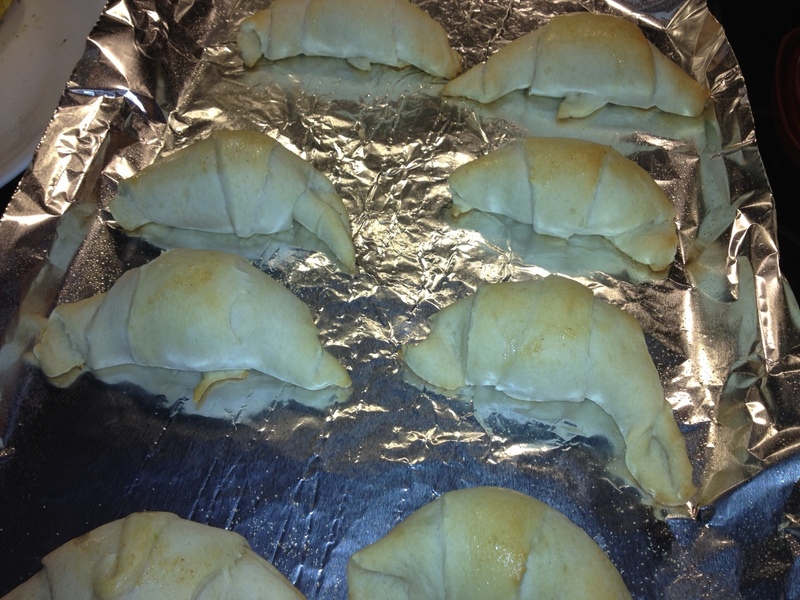 I pulled them out and brushed the top with butter and garlic powder and put them back in to make them more golden. Be careful when you bite in, the inside is even hotter than the outside! The cheese will scald your tongue!! You could easily make this vegetarian, but since the bacon does so much for the flavor perhaps add something to the cream cheese. I bet it would be good with a little salt, pepper, garlic powder, and Emeril essence. Or whatever your heart desires! Enjoy! 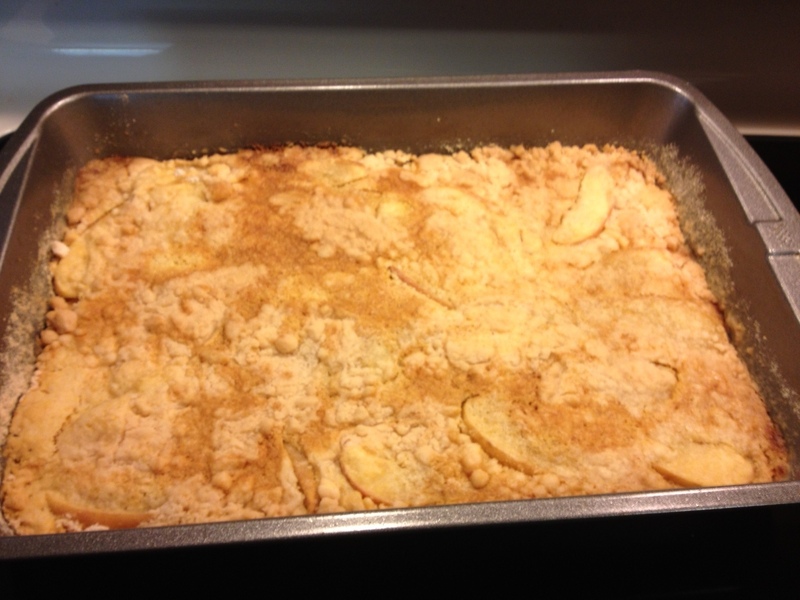 And stay tuned for the Easy Peasy Apple Cake! 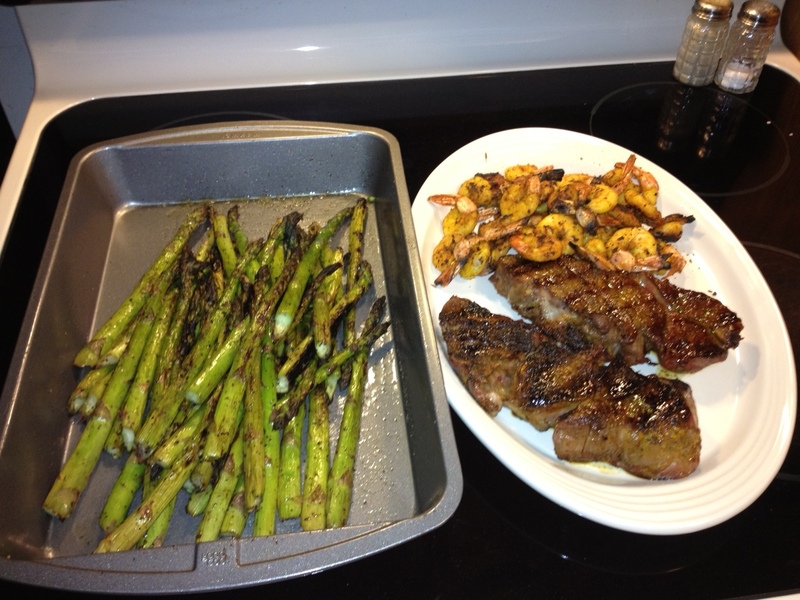 That’s steak, shrimp, and asparagus you see there. The steak recipe you’ll have to pry from my cold dead fingers because it’s a family secret and by family secret I mean only my husband and I know it. My son won’t even get to know it until he fully understands the meaning of keeping secrets. All I can say is, it’s AMAZING and you’ll have to just patiently wait for an invite to enjoy this steak. Yea we’re a little snobby about our steak. We never go anywhere to eat steak because we’re usually displeased. We frown upon those that only season with salt and pepper…what the heck?! (Do you see the salt and pepper sitting in time out in the picture?) There’s a smorgasbord of wonderful spices and you settled on salt and pepper?! Step out of the bland food bubble and go on a spicy adventure! I suppose I can tell you how I made the asparagus….olive oil, garlic salt, pepper. Nothing fancy, but the garlic salt really goes well with the flavor of the asparagus. That’s not just salt and pepper…there’s a third thing there. 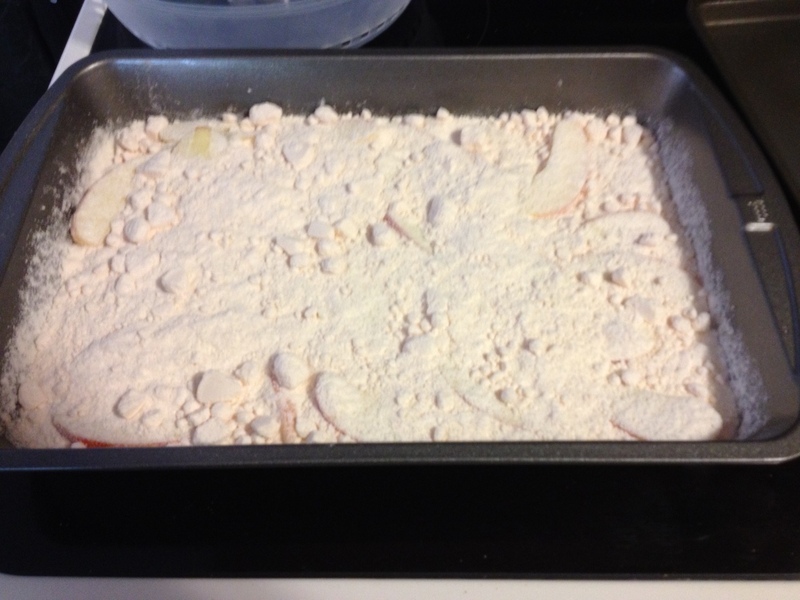 The shrimp…salt, pepper, turmeric, cumin-coriander, red chili powder, and Slap Ya Mama Cajun seasoning. Sometimes I throw in cumin seeds, but I didn’t this time. You could do these on the grill or in the oven or stove top. Wash it all down with an ice cold beer! !